Are you glad it’s Friday? I know I am. I love the weekends mostly because Derek is home. In case you hadn’t noticed, I think he’s the bees knees AND elbows. And because I have several posts in the works, but none that are ready, I give you 2 random, but cool (I think) photos. Enjoy! This guy was pitching a fit about something. The noise he made drew me outside to investigate. I don’t know who he was telling off, but he had a thing or two to say, about a thing or two. His ginormous self was at the top of one of the trees in the front yard. I took this shot from my backyard. As soon as he realized he had paparazzi, he skedaddled. 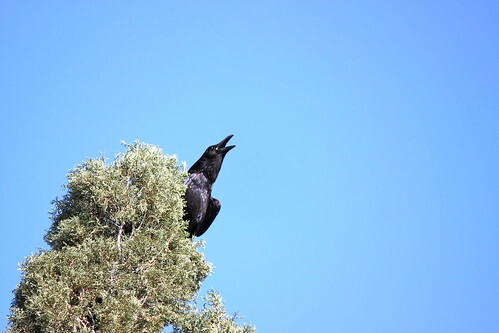 Goodbye cranky crow. Blooms from one of our Bird of Paradise bushes. The flowers are abundant and last for quite a while, hummingbirds and butterflies adore them, and they require very little/if any attention. They are easy to like. 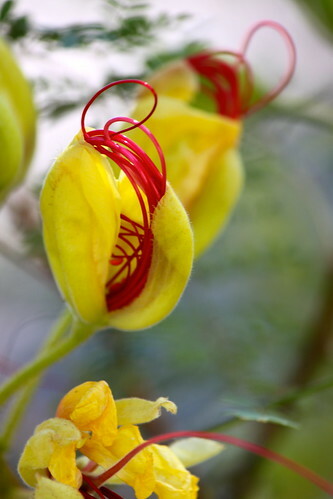 My favorite is just before they fully bloom, when the shiny red stamen is peeking out of the bright yellow petals. They look science fictiony to me.